Since 2007 Our Cannabis infused Medical Beverages have been blended with the finest Organic ingredients , we infuse our beverages in Colorado with the highest quality Co2 extracted Medical Marijuana that is “Variety” specific. A wonderful healthy alternative to smoking and most edibles. Fully activated Sodium Free– Gluten Free – Sugar Free , Soy Free (* except Chocolate products). All of our products are always Lab Tested to ensure consistency in dosing and transparency for grow materials. What is Co2 extracted Hash Oil? Why is it so beneficial? Co2 extraction is the cleanest and purest form of pharmaceutical grade Hash Oil. The oil allows the consumer to ingest and absorb the cannabinoids of the Marijuana Plant at a sublingual level, delivering them to the blood stream directly. Along with all of the health benefits of the plant, there is very little aftertaste and very low aroma, allowing for a uninhibited Edible Experience! Instant just pour into a cup and pour hot water over. Adding a sweetener or milk of any kind can aid absorption of THC. By creating Varietal ( Sativa / Indica ), specific blends we offer our clients both “Head High” – Active Blends with our Sativa / Caffeinated blends and body restorative Relaxing Blends with our Indica / Decaffeinated blends. Choose a blend that is right for you. Our Organic Instant 100% Arabica Cannabis infused Coffee’s & Mocha’s are blended by hand with global herbs and spices, manifesting health and a unique experience. 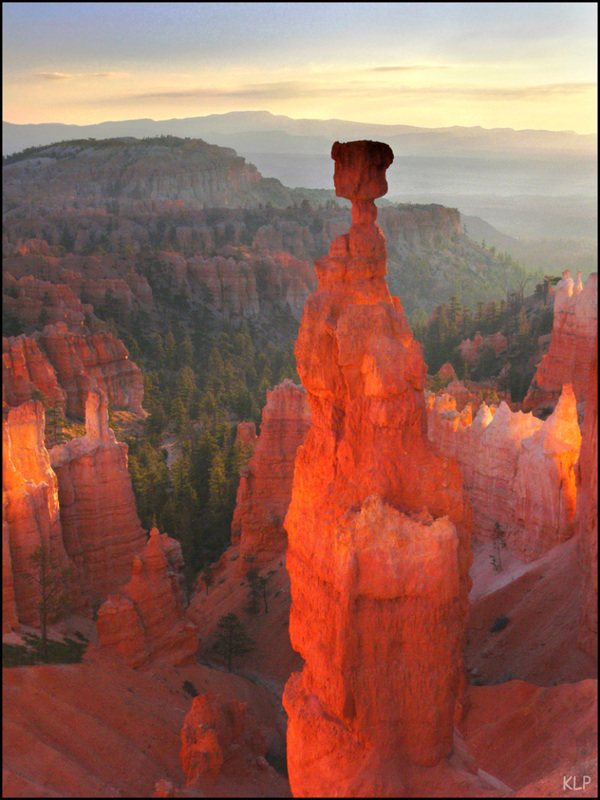 May aid; migraines, insomnia, hormonal issues, body pain, digestion, stress, shingles, poor circulation, depression. Our Caffeinated/Sativa – Active Blends are the perfect match for the “on the go client”. Judge not, lest ye judge yourself. If you must judge don’t hold a grudge. Made from 100% Arabica beans, our organic instant coffee is shade grown at higher elevations which produces a naturally flavorful, yet mild taste. Coffee & Spices, Sativan & Caffeinated, Active Blend. Available in 100mg only that dose. 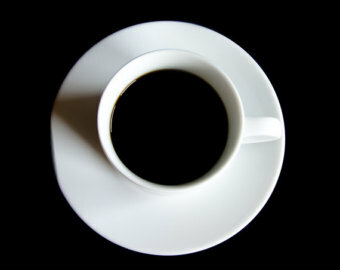 A fully caffeinated dark roast with low acidity, hand blended with spices. A Rubenesque body dressed in Mayan camouflage. A Sativan Siren, a loyal Patriot to the palate, this soldier is a steadfast defendee. Exiling Pain and discomfort in the most tastefully aromatic way. Coffee & Spices Sativan & Caffeinated, Active Blend. Available in 50mg only that dose. 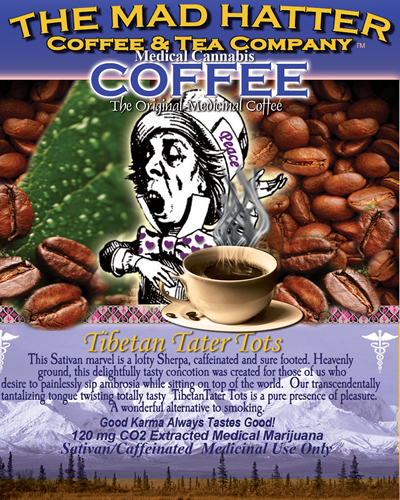 This Sativan marvel is a lofty Sherpa, caffeinated and sure footed. Heavenly grounded this delightfully tasty concoction was created for those of us who desire to painlessly sip ambrosia while sitting on top of the world. Our transcendentally tantalizing tongue twisting totally tasty. Tibetan Tater Tots is a pure presence of pleasure. Coffee & Spices Sativan & Caffeinated, Active Blend. Available in 300mg only that dose. 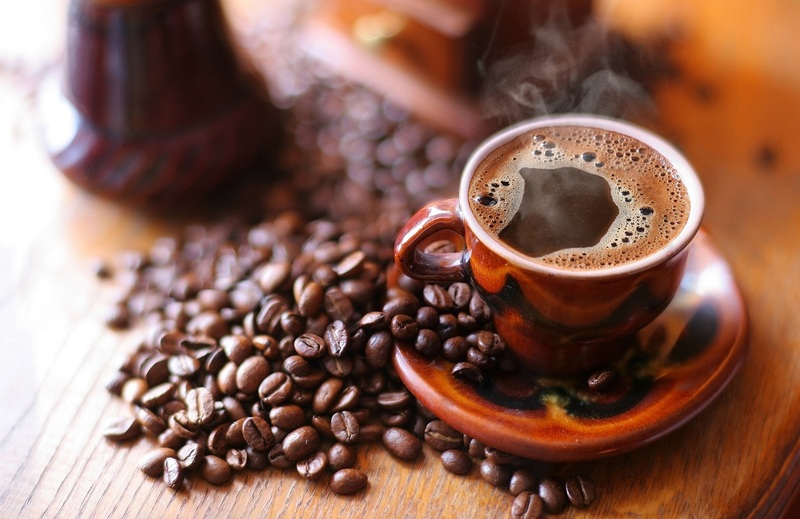 Our Organic Instant Coffee is a blend of 100% Arabica coffee beans with a smooth, rich flavor. These choice beans are carefully selected from only organic growers who provide a safe social and economic environment for their workers. 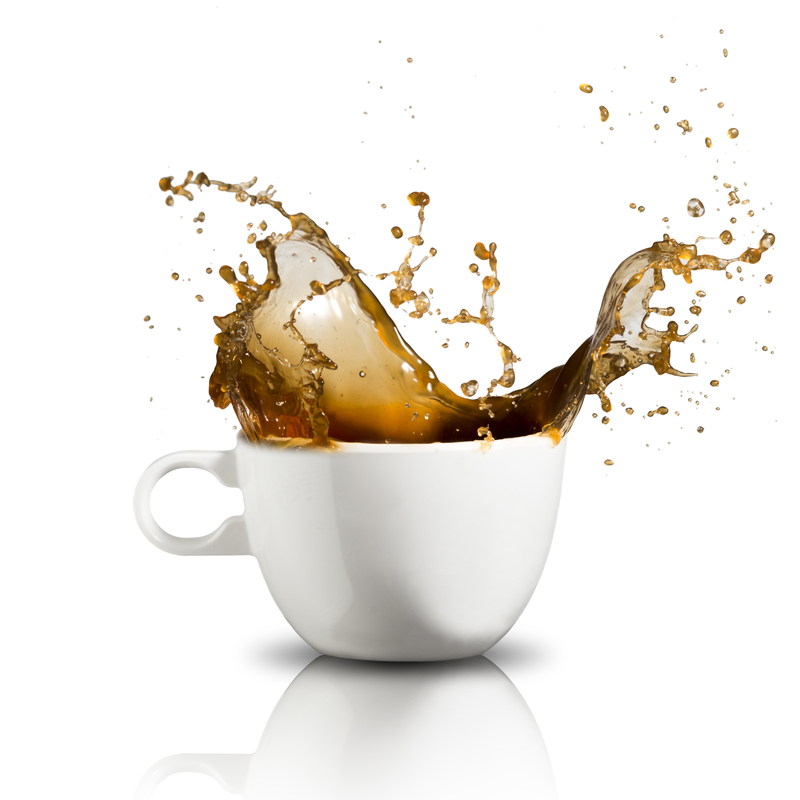 Our crisp mellow coffee is decaffeinated naturally through water process. May aid hormonal issues, body pain, anxiety, and insomnia. 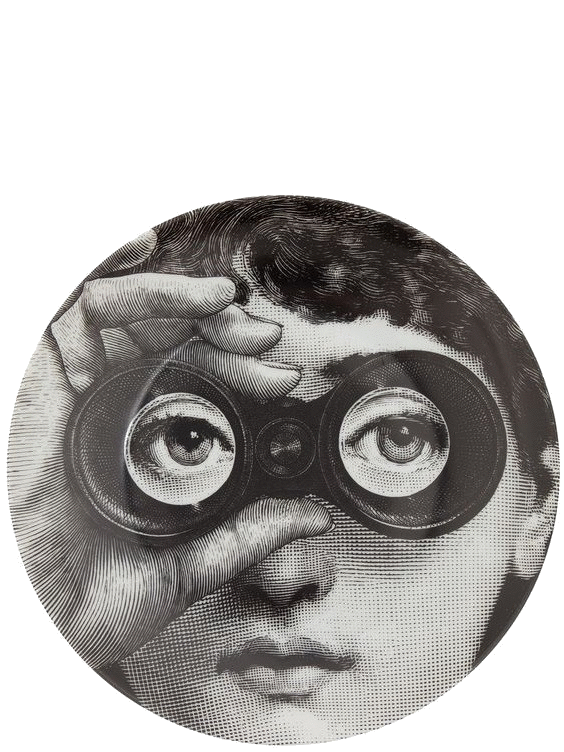 The rumors whispered, innuendo tip toed, suppositions foretold, freedom of choice is never over sold! This Indican / Decaf Coffee is subtle and sublime. Coffee & Spices,Decaffeinated / IndicanRelaxing Blend. Available in 50mg only that dose. Familiarity breeds contentment. 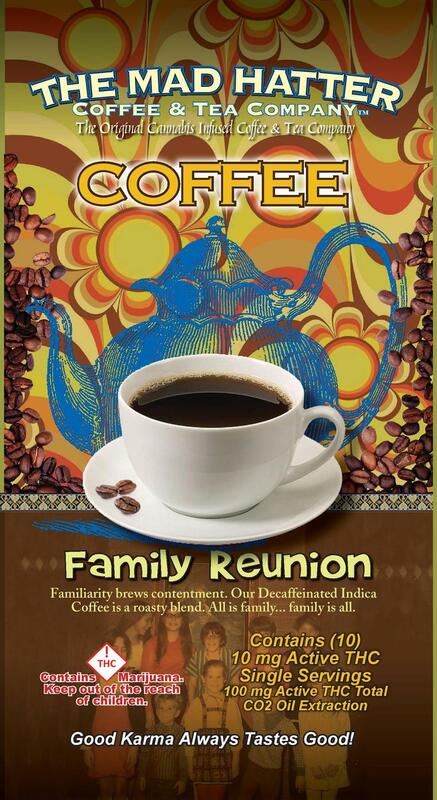 This refined playful Indican Decaff Coffee is the perfect middle ground for reconciliation. Coffee & Spices, Decaffeinated / Indican Relaxing Blend. Available in 100mg only that dose. Like a potter at the wheel, this Indican Elixir will most thoughtfully round out all the sharp edges of the day. 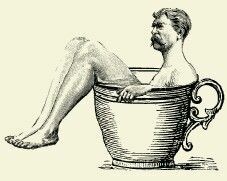 The progeny of this lovely Decaf patiently enlightens one’s thoughts, subdues physical needs and restores the delicate balance of body & mind. Sip and Enjoy. 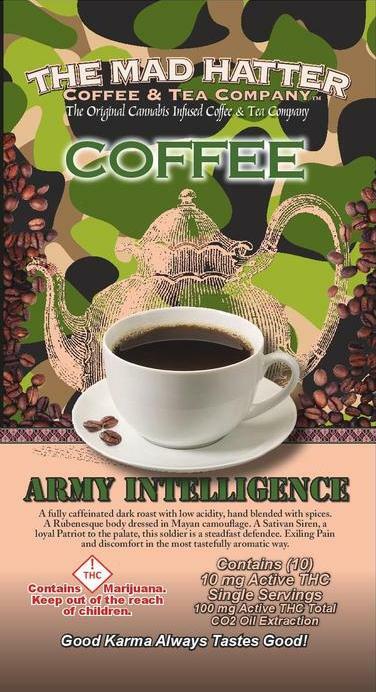 Coffee & Spices, Decaffeinated / Indican Relaxing Blend. 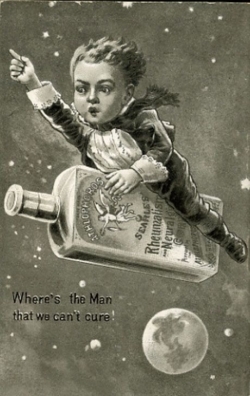 Available in 300mg only that dose. All our Tea Blends are Certified Organic, Soy, Gluten, and Sugar-Free! 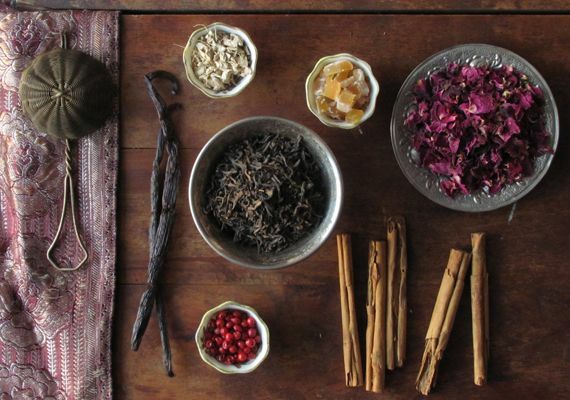 Our Tea, Chai and Mushroom Elixir blends are unique and include a variety of herbs and spices that may give additional health benefits. 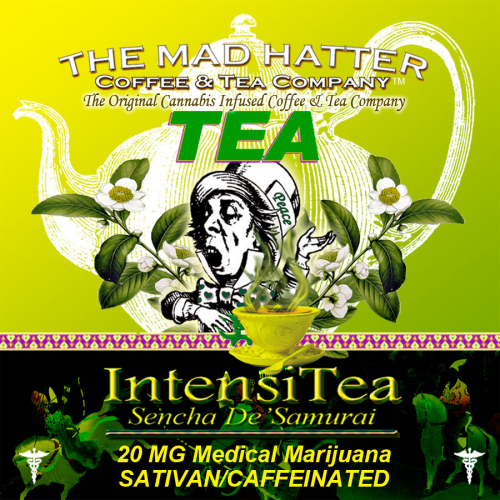 Our Caffeinated/Sativa Tea’s are exhilarating Active Blends and Our Herbal /Indica Tea’s are the perfect Relaxing Blends. Organic, Soy, Gluten, and Sugar Free! Our Active Blends are a beautiful blend of Sativa & Caffeinated Artisanal Tea’s. Designed for those seeking an extra boost or a calming resilience while introducing all the health benefits of cannabis. Blended with additional herbs and spices for balance. These artisanal Active Blends may aid ; immune deficiency, increase anti- oxidants, cancer prevention, natural antibiotic, heart disease. Iced or brewed, Summer or Winter these blends are designed to heighten your senses. The Green Tea Goliath, Chaperoned by a Samurian sentry. 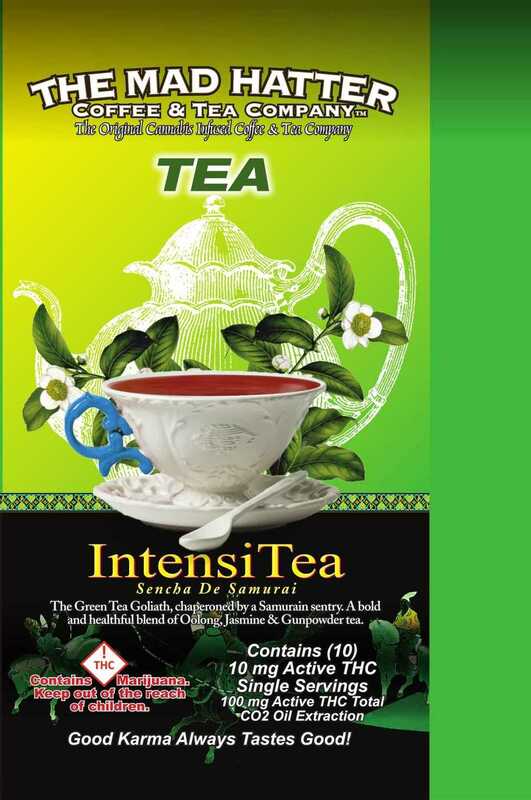 It is rumored that green tea strengthens tooth enamel, and contains one of the highest levels of antioxidants. May be used to stabilize blood sugar levels in diabetics, clears skin affected by acne and aids in the treatments & prevention of cancer. Oolong, Jasmine & Gunpowder blended with spices. Sativan & Caffeinated, Active Blend. Available in 50mg, 100mg, 300 mg doses. Certified Organic, Soy, Gluten, and Sugar-Free! 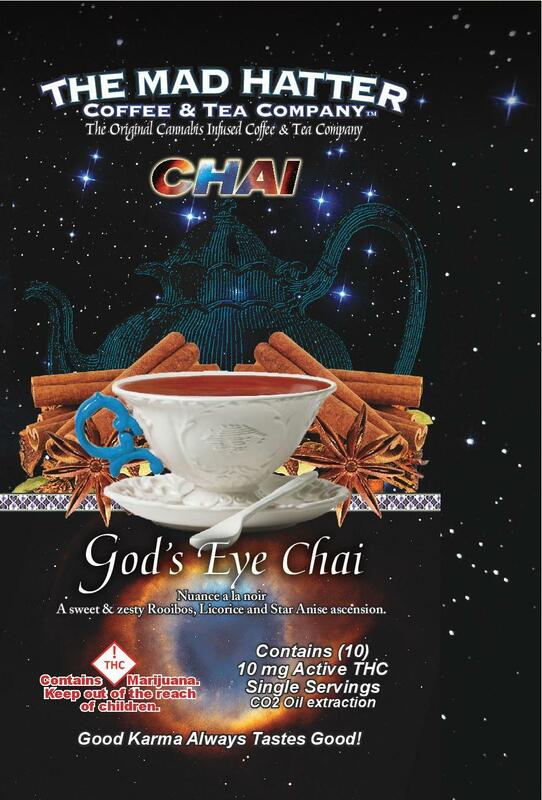 These lovely Chai’s have been ordained by higher powers. 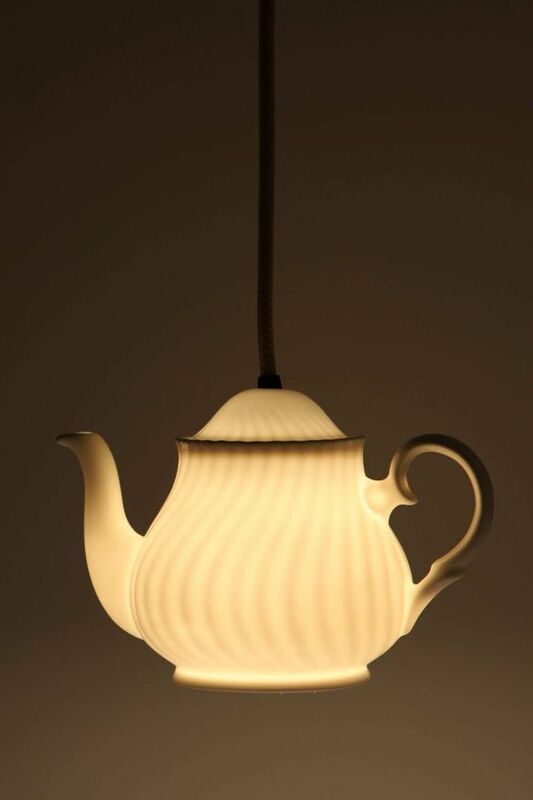 The Chai lover’s dream. 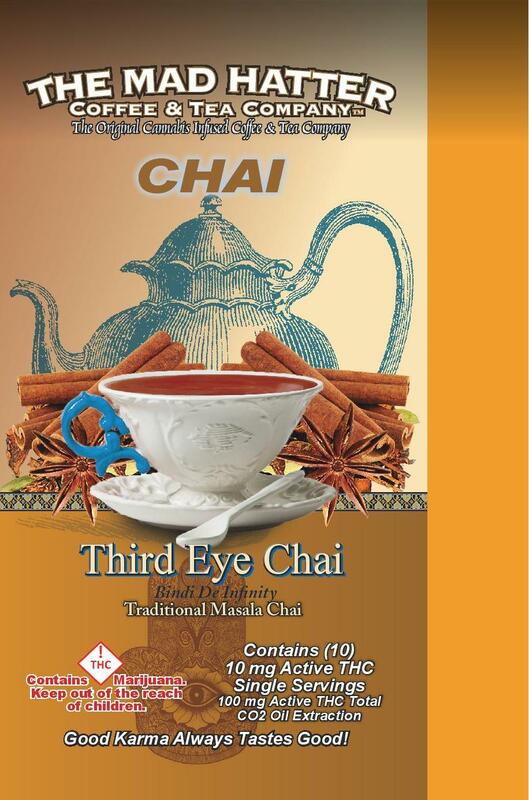 Our Chai Blends both our Masala Chai & our Rooibos Chai have additional herbs, spices & Wild Harvested Mushroom Proteins that may benefit Cancer Prevention, Tumor Reduction, Alzheimers, Hepatitis B and C, antimalarial, HIV inhibitor, blood pressure and Cholesterol reduction, thrombosis, candida, chemotherapy symptom alleviation, pneumonia, tuberculosis, nausea, sinusitis. 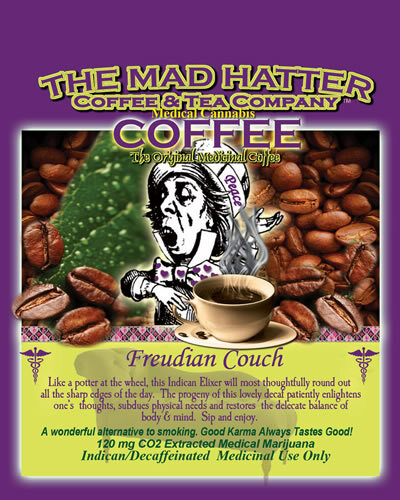 Available in Decaf/Indica Relaxing Blends & Caff/ Sativa Active Blends. Available in 50mg, 100mg, 300 mg doses. Certified Organic, Soy, Gluten, and Sugar-Free! Our Relaxing Blends are a wondrous break from the day. May relieve stress levels while transporting you to a garden of flowers and fruit that serve well iced or brewed. These delightful exotic Indica blends may aid; digestion, stress, allergies, respiratory issues, nausea, insomnia, skin complexion, arthritis, hormonal imbalance. Our Tea Blends have additional spices and herbs that may alleviate: immune boosting anti oxidants, cancer, colds, heart disease hormonal issues, migraines, blood sugar instability, allergies, acne, depression,… among others. 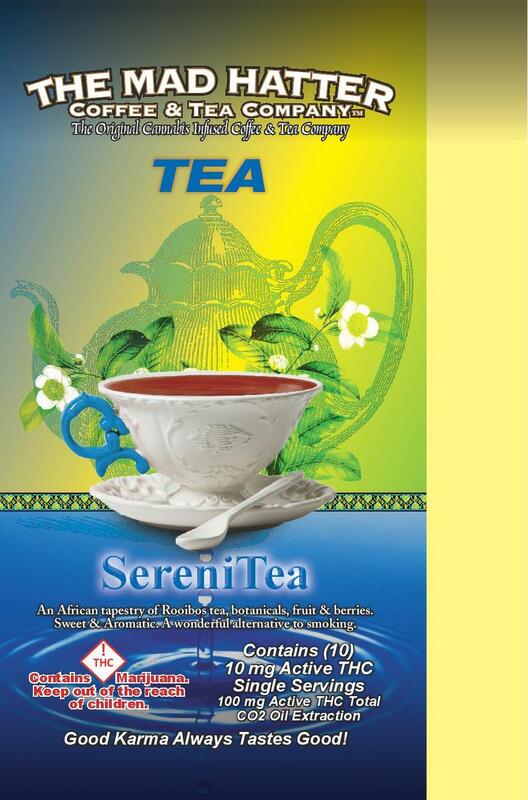 Available in Decaf/Indica Relaxing Blends & Caff/ Sativa Active Blends. Available in 50mg, 100mg, 300 mg doses. Good taste is always understated. It is rumored that green tea; strengthens enamel, contains one of the highest levels of antioxidants, has been used to stabilize blood sugar levels in diabetics, clears skin affected by acne and aids in the treatment & prevention of cancer. Ginger, Tangerine, citrus. Herbal/Indican, Relaxing Blend. Available in 50mg, 100mg, 300 mg doses. Drink with the Gods, for one becomes the company they keep. Cabernet Grapeskins, cacao nibs, acai, macai berries, dark fruits. Herbal/ Indican Relaxing Blend. Available in 50mg, 100mg, 300 mg doses. 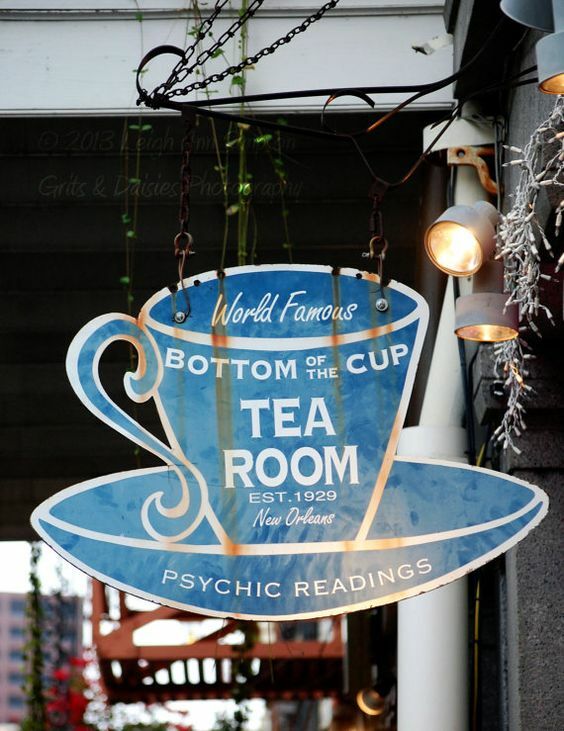 This Rooibos tea, Herbal /Indican Chai is speckled with star anise, Licorice, ginger, ramon nut seed and cardamom to round off this celestial-bodied beverage. Rumored to aid digestion and increase circulation. Herbal/ Indican, Relaxing Blend. Available in 50mg, 100mg, 300 mg doses. Organically Blended for Health conscience and Health challenged. 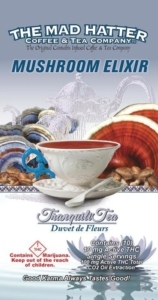 These Organic Tea blends contain Reishi, Turkey Tail, Shitake, Phellinus, Poria Mushrooms, Osha, Pau De Arco and Ginko Biloba. These ingredients are rumored for Anti-tumor, Anti-microbial, Immunomodulating, Anti-oxidant, Hepatitis B and C, antimalarial, HIV inhibitor, blood pressure and Cholesterol reduction, thrombosis, candida, chemotherapy symptom alleviation, pneumonia, tuberculosis, Alzheimer’s, nausea, sinusitis, asthma, tinnitus, True tonics for the health-minded. Earthy robust black tea blend. Black Tea, Reishi, Turkey Tail, Shitake, Phillenus, Poria Mushrooms, Osha, Pau de Arco, Ginko Biloba. Caffeinated/Sativan, Organic. Active Blend.Available in 50mg, 100mg, 300 mg doses. Gentle and Soothing, this chamomile Mushroom Blend is the perfect night time or gentle day guide. 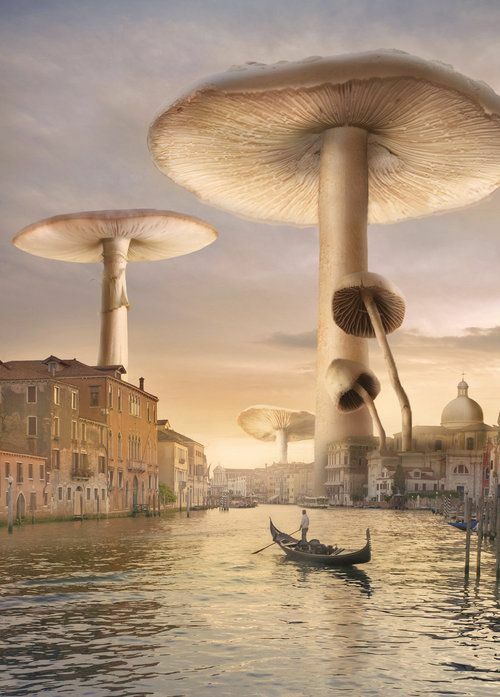 Chamomile, ginger, fennel, Reishi – Turkey Tail – Shitake – Phillenus – Poria Mushrooms, Osha, Ginko Biloba, Pau de Arco. Herbal/ Indican, Organic. Relaxing Blend.Available in 50mg, 100mg, 300 mg doses. !! THRILLING NEW READ !! 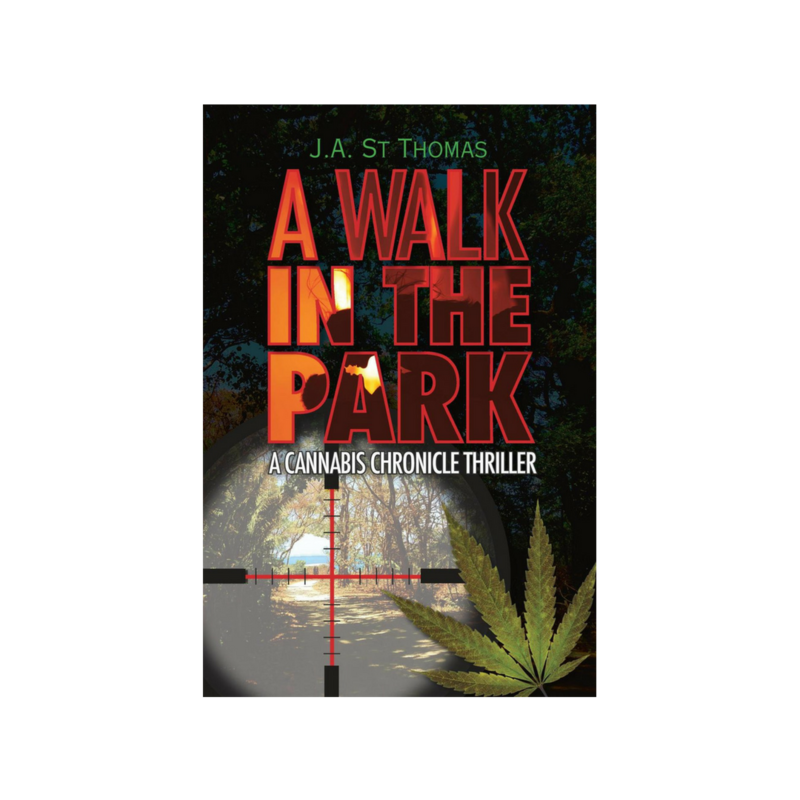 "A Walk in The Park, a cannabis chronicle thriller." What does “variety specific” mean to me? Sativa: which gives the consumer an active , head high – good for busy days or extra energy. Indica: which gives the consumer a relaxing , body rehabilitating high – good for easing stress, insomnia or anxiety. 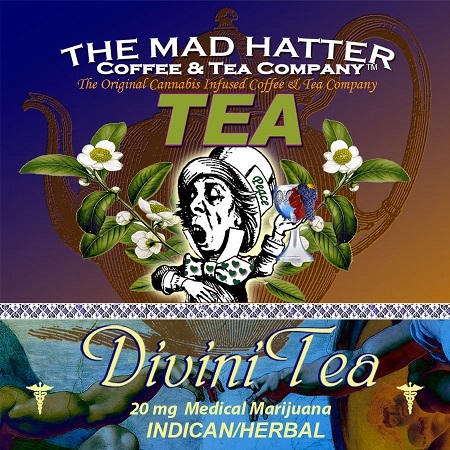 Mad Hatter Coffee & Tea is Variety Specific, we blend our active Sativa with our Caffeinated drinks & we blend our relaxing Indica with our Decaf/Herbal drinks. More ways to Medicate. 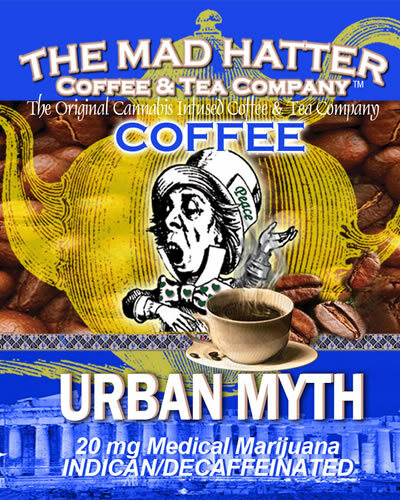 Since 2007 in the Cannabis industry Mad Hatter Coffee & Tea is now available in multiple States where Marijuana is legal for Medical or Recreational Use. You must be 21 or older for recreational usage. 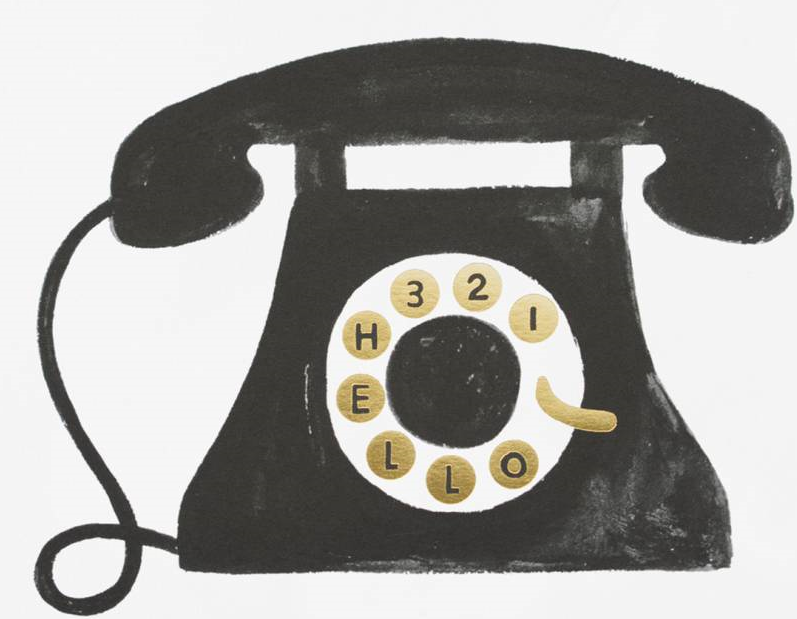 If you are looking for products near you please enter your zip code in our search box. 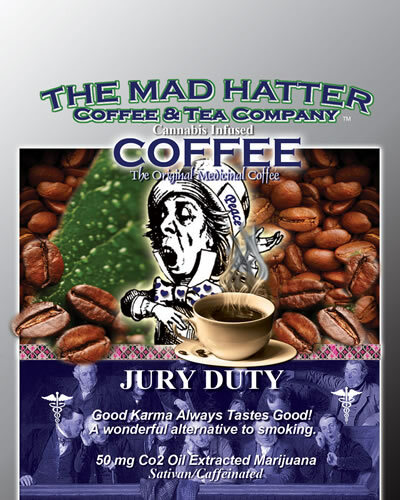 Mad Hatter is available in many states, please click the link to your state under the Beverages link for more information or call us directly. Please click the link to your state under the Beverages link for more information. You may find How to prepare our products and recipes and video tutorials on our visuals page. 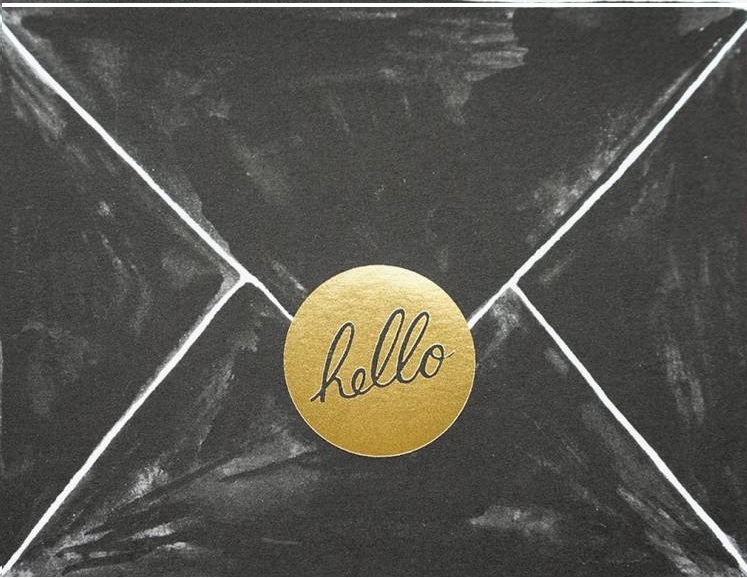 We love hearing from you, please let us know what you think of our products, or if there is something you would like us to add to our line.